I feel like I’m starting out with baby steps here, but falling a lot. I have to admit I’m surprised and a bit embarrassed, actually – I considered myself hyper-aware of what’s in my food and thought I’d have an easy time with this challenge. But it turns out I’m not even at the toddler stage of unprocessed eating. Admittedly, I haven’t done a lot of planning yet, and I think that may be the key. Oatmeal with natural peanut butter, flax seeds, raisins, and milk. Coffee (get used to seeing that one). This is my usual breakfast. Breakfast and lunch went off without a hitch. I resisted break-time treats (cookies and banana bread) in the lunchroom at work, even though they were being offered for a good cause. On a normal day I would have rationalized sampling at least one of these (they’re homemade, after all) but it would make for a lousy start to a challenge if I was breaking my own rules by 10:30 a.m. on the first day. After lunch, I was seriously craving something sweet. Usually I would walk to Tim Hortons and get a coffee and two Timbits (that’s mini donuts or donut holes, for the non-Canadians in the crowd). I drove to the bulk food store instead, hoping to find something unprocessed that would satisfy. I found mixed nuts (including the coveted Brazil nuts), unsulphured dried apricots, and dry-roasted almonds. The only “treats” to be found that may be considered unprocessed were mostly cane juice (sugar!) mixed with seeds. I thought I’d be better off making them at home (less sugar!) and besides, I’ve had them before and wasn’t a huge fan. I came home from work and ate some organic cottage cheese before realizing we’d need it because we couldn’t barbeque after all since the store five stores were out of propane for the barbeque. 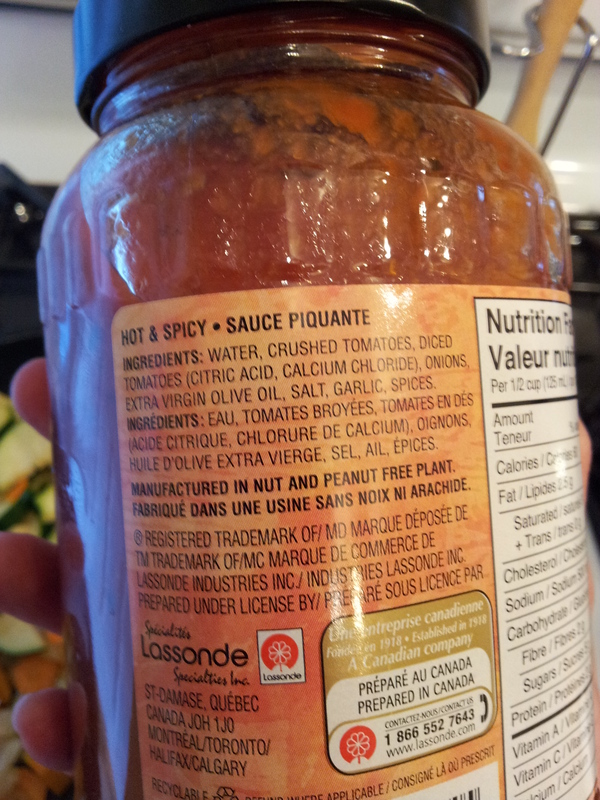 While I thought this was a passable substitute, it wasn’t until I was already cooking that I read the ingredients thoroughly. Buckle up. 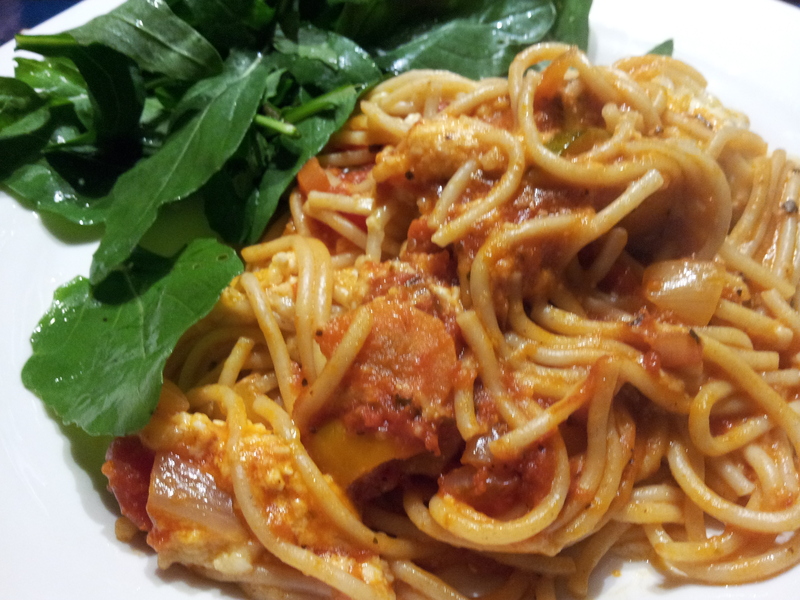 The pasta sauce (which isn’t that cheap, sugary stuff) came with a side helping of citric acid and calcium chloride; two ingredients that fail the kitchen test. 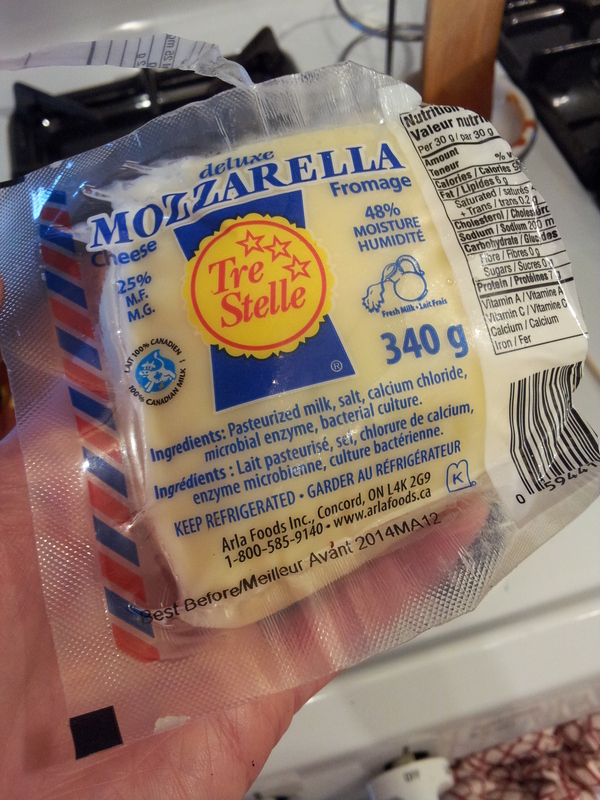 When it comes to cheese, it turns out I’m clueless. There’s calcium chloride again, and some microbial enzymes I’m going to assume (for now) are naturally derived and necessary for cheese-making. Finally, cottage cheese: I bought the organic stuff because a) I care about cows and b) it’s usually a shortcut to “more natural”. 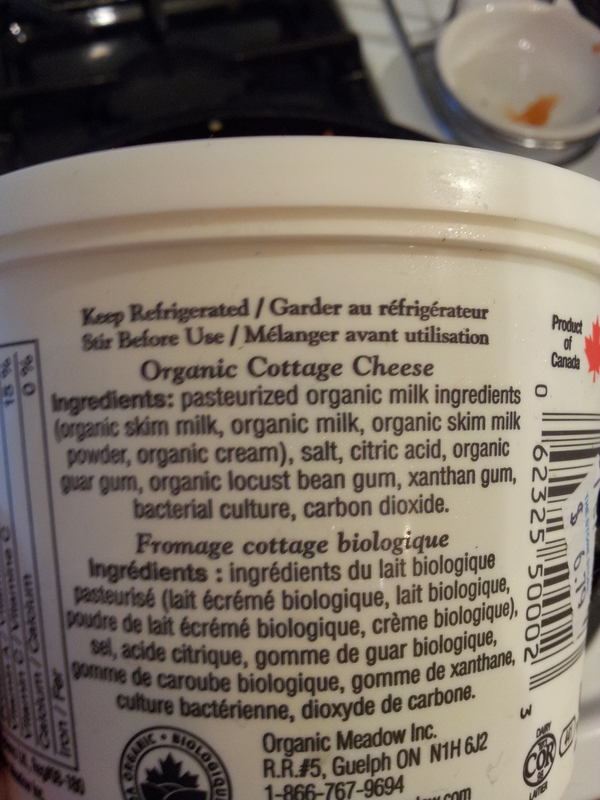 If you can’t read that tiny ingredients list, it says: pasteurized organic milk ingredients (organic skim milk, organic milk, organic skim milk powder, organic cream), salt, citric acid, organic guar gum, organic locust bean gum, xantham gum, bacterial culture, carbon dioxide. Little Miss Muffett would be astounded at those curds and whey. Just about the only natural or unprocessed thing I ate last night was the arugula that came fresh from my garden and the zucchini from the grocery store. Good thing there’s always tomorrow.